Here we’ll walk you through the process of configuring the laser cutter with the proper settings. Prepare your file using the guidelines found in the Laser Cutter File Preparation page. Copy your file to the desktop of one of the two computers in the Digital Fab room and then open it in Adobe Illustrator. If you used CS6, the Illustrator version on these computers, then it should open just fine. If you used Creative Cloud then you may encounter a pop-up window (just click OK) and your file may appear slightly different than it did when you made it. If that happens then you may want to open up the Laser Cutter Template found on the desktop of the computer and copy your artwork into it using the Copy and Paste commands. The laser cutter connects to the computer like a traditional printer. 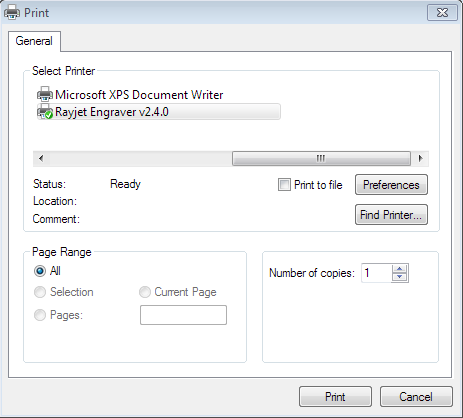 To continue, select Print from the File menu. You should see the Adobe print pop-up window appear. 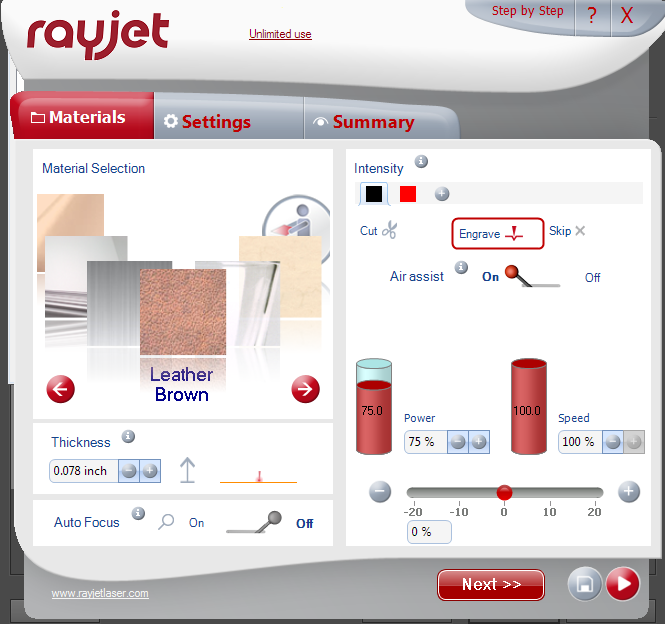 The Rayjet Engraver should be selected as the printer by default but, if it isn’t, select Rayjet Engraver v2.4.0 as the printer from the pull-down menu. 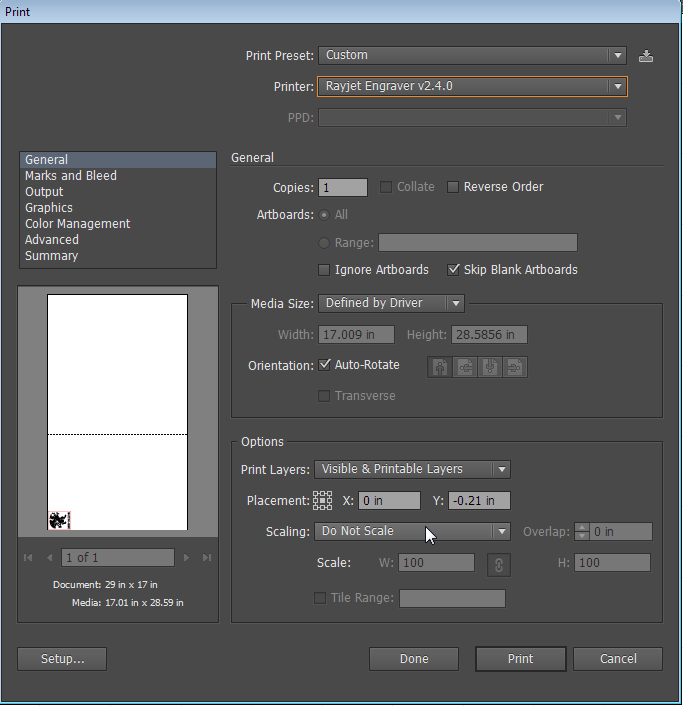 In the Adobe print window choose RayJet Print Preset — Use This! from the Print Preset pull-down menu (at the top of the window). 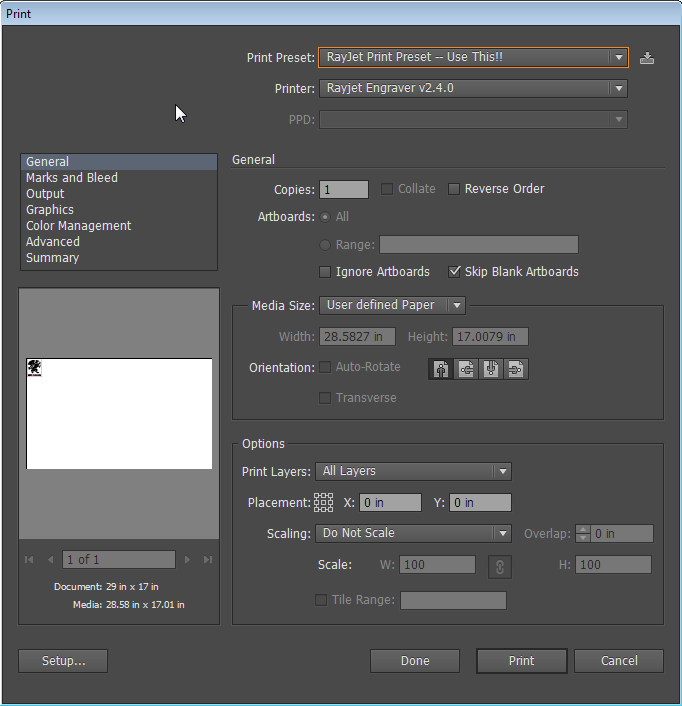 The Print Preset may revert back to Custom after you select RayJet Print Preset — Use This! but the settings will be preserved. 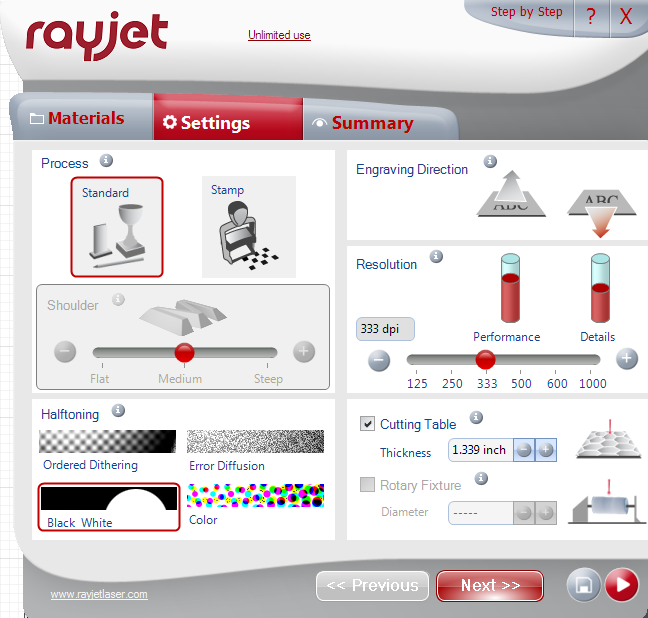 If you like you can select it again and it’ll remain as RayJet Print Preset — Use This!. To continue configuring the laser cutter click the Setup button in the lower left corner of the Print window. Another Print pop-up window will appear. Click the Preferences button to continue. 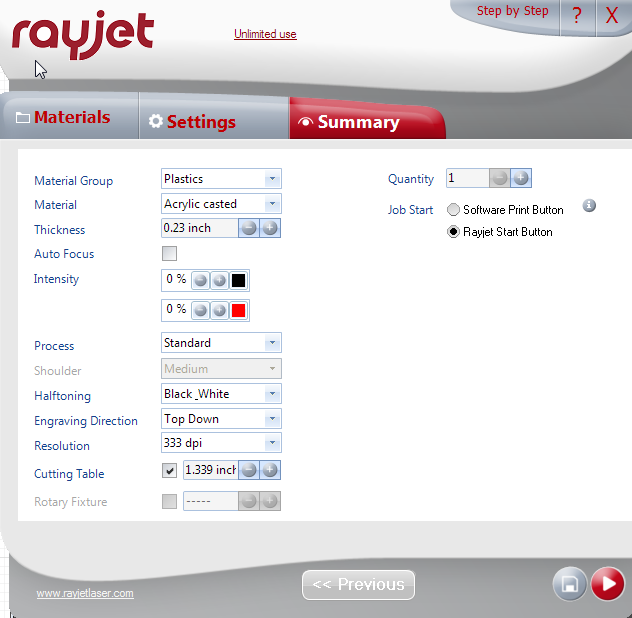 The Rayjet laser configuration menu will appear. It’s where we’ll set up the laser for our particular material and operation. The first page is titled Materials. 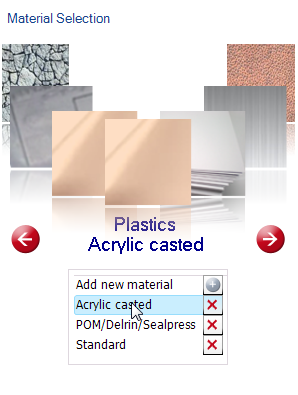 In the Material Selection pane click through the various material options to find the one that most closely describes your material. 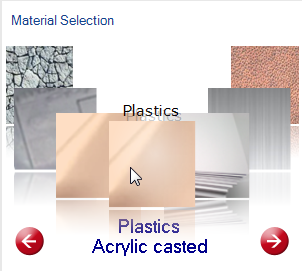 Once you’ve selected a type of material then you’ll have to select a sub-type of material in the drop-down menu that comes up below the material images. If you forget to do this the software will revert back to whatever materials was in use in the previous laser project. We don’t have auto focus so we’ll ignore the sections on Thickness and Auto Focus. In the right-hand pane (titled Intensity) you’ll set the laser power and speed for your application. These settings are empirical and our suggested settings can be found on the Laser Power and Speed Settings spreadsheet. The colored tabs at the top can be configured separately either as Cut or Engrave. You can have multiple cuts and engraves (with more than two tabs) but for now we’ll focus on one engraving color (black) and one cut color (red). 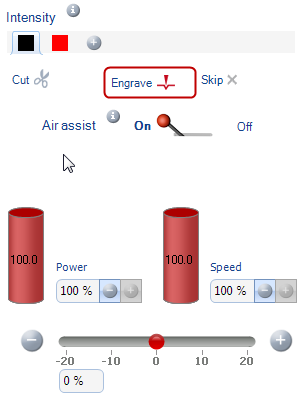 Click on the black tab and then select Engrave. After you’ve done that, check to see that the Air assist “switch” is set to On. Air assist helps keep the lens clean and should always be set to On. Set the Power and Speed settings according to our suggested settings. Ignore the slider underneath the Power and Speed settings. Click on the red tab and then select Cut. Again ensure that Air assist is set to On. We almost always only do on cut pass so set Passes to 1. 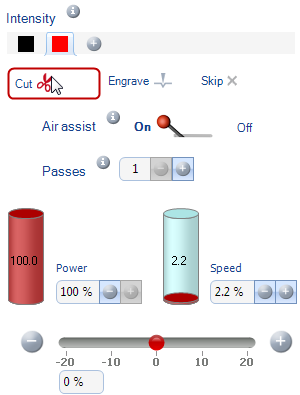 Then set your Power and Speed settings for your cut using the suggested settings. Once you’ve completed these settings click the Next button at the bottom to proceed to the next page, titled Settings. 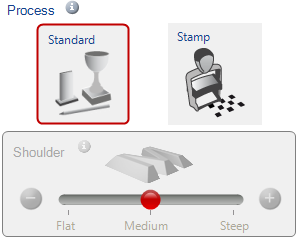 In most cases (outside of actually making stamps) the Standard Process is appropriate so click the Standard button to select normal operations. For your engraving select the appropriate Halftoning. In our example file the image is black and white so clearly Black White is the proper choice. For most gray scale images the Error Diffusion setting looks most natural. Color is reserved for situations where you’re sending a color image to be engraved (like a photo). Ordered Dithering looks OK in some situations but default to Error Diffusion for most gray scale applications. Under Engraving Direction we recommend using the top-down setting (right hand side). Resolution can be adjusted over a wide range for different applications. In most cases, at least 90%, we find that 333 dpi is the appropriate resolution. Higher resolution choices (600 dpi, 1000 dpi) slow down the engraving considerably so only choose those when really necessary. Resolutions lower than 333 dpi may result in difficulty with making cuts so, leave it at 333 dpi unless advised otherwise. Select your Resolution by either moving the slider. Disregard the Cutting Table and Rotary Fixture settings and click Next to go to the final page, titled Summary. If you did everything correctly beforehand there’s no need to review anything on this page. Click the Process button (red arrow in lower right corner) to proceed. The settings will be saved. You have successfully configured the laser and are ready to cut or engrave your part. Follow the steps on the Operating the Laser page to complete your project.